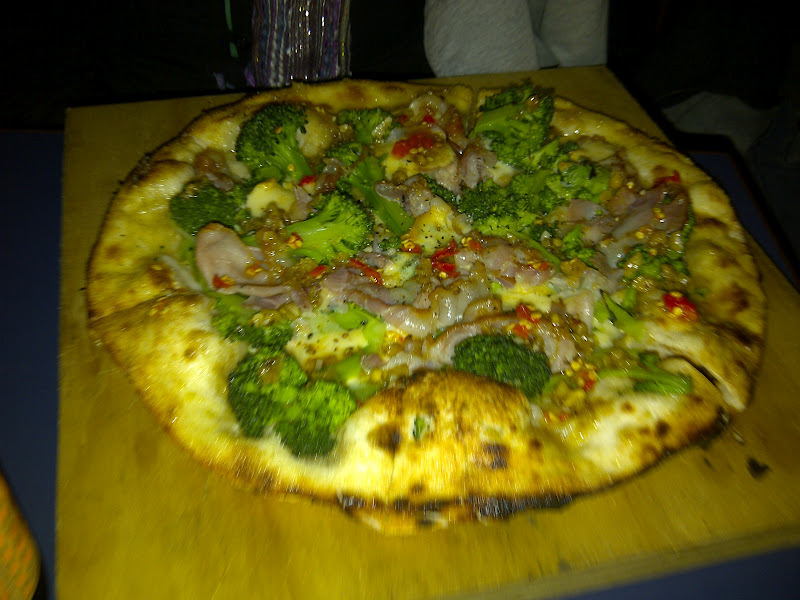 What better way to top off a sunny afternoon in the country than with some exceptional pizza? First incarnated as simply the St Andrews Pizza Shop, A Boy Named Sue has been generating quite the buzz from its humble home perched high above - but not so far from - the big city. Rocking up as the last of the day's warmth flew moonward and the icy night air descended, St Andrews took on the aspect of a ski town as locals hovered around a brazier while awaiting takeaways, and travellers like us gradually divested of woollens as we settled into Sue's welcoming space and took in the smells of woodsmoke, dough and garlic. 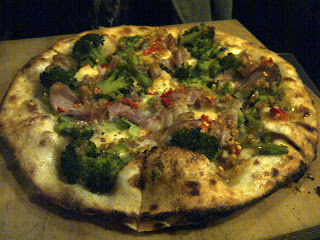 There's plenty of the latter on their white-based pizzas, such as the Peter Broccoli - with tallegio and walnut pesto. And chilli - quite an ample smattering of chopped fire, seeds and all. The Italian Job, with salami and olives, featured an exceptional tomato base, which was surely not tinned but merely blistered toms smeared liberally on the base. And the base's are something else. They're thicker than us Brunswickers might be used to or prefer, but they have all the lightness of the thinnest, crispiest based pizza you can get. A lot of the thickness is air, as the bases puff up in craters worthy of the full moon that overlooked our evening. Head north and check it out.